We made a technology transfer contract with Shinpoong Pharmaceutical for the commercialization of Medicurtain® and have received the royalty of 2% for total annual sales. We won the Korean President Award at Korea Invention Patent Exhibition in 2015. 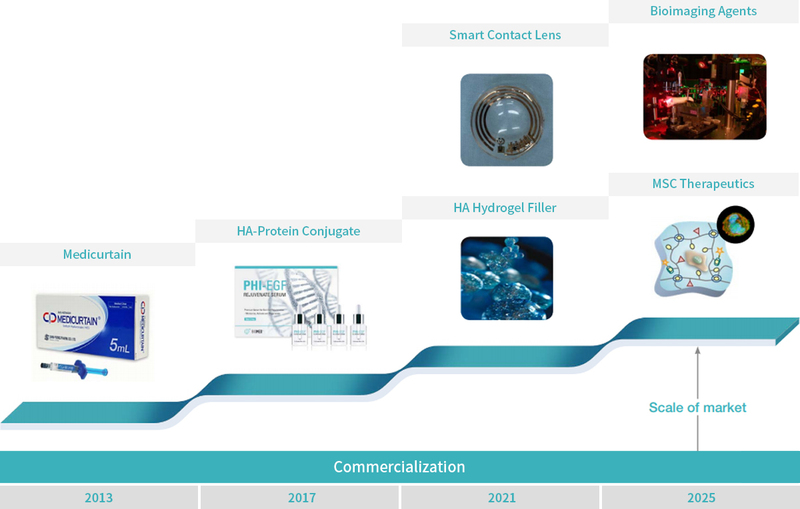 A hyaluronate (HA) hydrogel filler for plastic surgery and synovial joints was developed and is being processed for commercialization in 2020 with pre-clinical and clinical trials. In addition, hyaluronate – interferon alpha conjugate was developed for the treatment for hepatitis-C virus infection. Currently, we develop hyaluronate – growth hormones conjugates, using growth hormones provided from LG Life Sciences. Also, in collaboration with Genexine, a customized cell therapy using self-assembling hyaluronate hydrogel is being developed for the treatment of intractable diseases. With these research results, we won the Ministry of Education Award in 2013. Recently, we have developed smart contact lens in collaboration with Harvard Medical School by carrying out Samsung Science & Technology Foundation project.